Abstract: The K7-pro represents MSI's second attempt at the AMD Athlon motherboard market. Did they get it right this time, or fumble trying? My past experience with MSI motherboards have always been positive. Their products are reasonably priced, generally good performers, and are usually rock hard stable when overclocked. Let's see if this trend continues with this 4 layer PCB motherboard that represents MSI's second attempt at the AMD Athlon motherboard market. Enter the K7-Pro. Slot A for AMD Athlon(TM) processor. Supports 500/550/600/650 MHz or higher processor. Supports three memory banks using three 168-pin unbuffered DIMM sockets. Supports a maximum memory size of 768MB for SDRAM. Supports 3.3v PC100 SDRAM DIMM. 1 AGP, 6 PCI, Supports 3.3v/5v PCI bus interface. AMD Irongate chipset. (Northbridge) 200MHz EV6 System Interface speed. Microsoft PC99 Compliant. D-LED(TM) (Onboard Diagnostic LEDs) (Reserved). T.O.P. Tech(TM) III (Thermal Overheat Protection Technology) (Optional). PC Alert(TM) III (System Hardware Monitor). Supports Accelerated Graphic Port (AGP) Add-On Card. TCAC (Built in Trend Micro Anti-Virus Protection on BIOS). Modem (Internal/External) Ring Wake Up Function. Vcore & Vi/o setting through BIOS. 1 floppy port supports 2 FDD with 360K, 720K, 1.2M, 1.44M and 2.88 Mbytes. 1 IrDA connector for SIR. The K7 PRO is shipped with 2 heatsink rests, one 40 pin - 80 conductor Ultra ATA 66 cable, one floppy drive cable, a manual, a LED sticker, the D-LED pamphlet, and finally a driver cd. AMD AGP Miniport driver, and IDE driver. 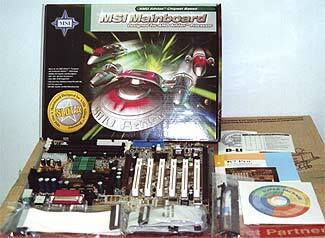 Also included is the MSI Utility, PC-Cillin'98 w updates (an Anti-virus program,) Media Ring, Remote Control Utility, and the standard Adobe Acrobat for checking out the manuals.